The life of the digital marketer can be hectic. 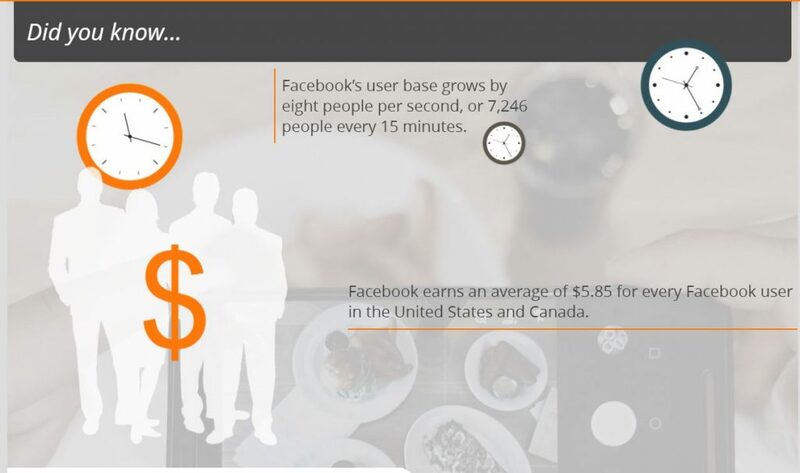 There’s a constant demand to produce high-quality and in-demand content for various platforms. If you ever struggle to keep up with the demand, you may benefit from starting to repurpose your current content. It’s not as hard as you may think. By repurposing your old content to interactive content you create brand new interactive content that your customer can engage with, you can track the engagement and gain key marketing insights and best of all – you save time! 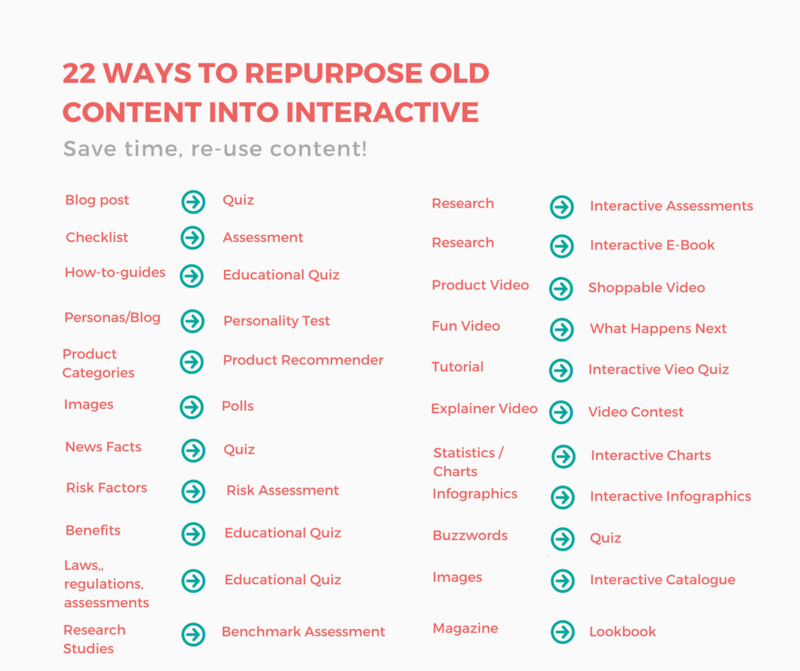 Let’s look at what content can be repurposed to different content. 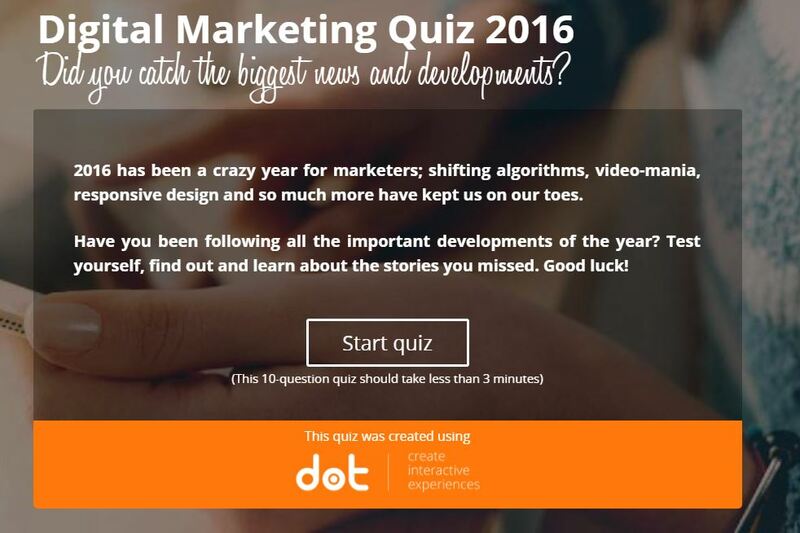 Example of a digital marketing quiz. Click here to try. You can turn a blog post to a quiz just like you with an assessment. You can create a knowledge quiz, educational quiz or a quiz contest. A quiz is a shorter form of assessment, not providing feedback for each question but a score and feedback in the end instead. 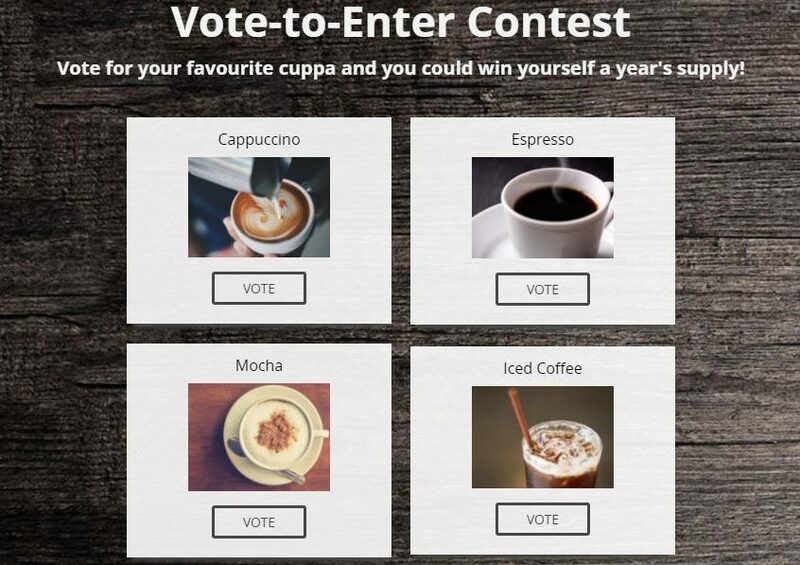 The example above is our marketing quiz from 2016 that we made, after reading a blog post on 4 different types of marketers. Let’s say you have a blog post on how to make homemade furniture, you can list up questions based on it, come up with wrong answers and create a feedback for the end. You apply the same feedback logic as with the assessment and split the score up into categories, designing different feedback for each. The feedback can be professional and/or include a sense of humour. If you have created how-to-guides it can easily be repurposed to an educational quiz to inform and test knowledge. It can provide instant feedback for each question. All you need to do is write down questions, come up with wrong answers, create feedback for each question explaining the right answer and create a feedback for the end. The feedback, in the end, can simply be the right answers to the questions with an explanation. Create your educational quiz here. Example of an emotional intelligence assessment. Click here to try. Let’s say you have a blog post about ten things to remember regarding SEO practices when writing a blog post, or a blog post about ten ways to improve your social media strategy. You can easily repurpose this into an assessment. You list up the important points in the blog and change them into questions. Then you come up with three wrong answers to each question and decide upon feedback to provide after each question and in the end. The feedback after each question usually explains the correct answer. The feedback, in the end, is a score based on questions answered correctly and short text. If you have ten questions, you can split the score into three groups based on how many questions were answered correctly; 0-3, 4-6, or 7-10. Then you come with a name for each category and feedback. The feedback can be purely professional or include humour. For people scoring 0-3 questions, you can propose improving knowledge in this field by reading your original blog post: For those answering 4-6 questions correctly, you can say the knowledge is good but can be improved if wanted and point to the blog post. For the highest score, you can complement the participant for a great performance. A personality test is a series of multiple-choice questions, where each answer option points to a specific personality type. When completed, the user is presented with the personality that fits his answers. In the example above the Danish furniture company, Møbler asks ‘What type of couch-potato are you?’ The personality test leads the client to one of three different types of a couch potato: the luxury-potato, the classic one, or the individualist. Let’s say you have a blog post about growing plants and your target audience is very interested in plants. You can repurpose the blog post to a personality test and ask your audience: ‘What type of plant are you? You will pick four different plant types, and add a personality description to them. A cactus could be strong and resilient, an orchestra is elegant and wise, and so on. Then you come up with questions with four answers, and each answer will be an indicator to each personality category. Create your personality test here. Let’s say you are in retail and you have different fashion categories for your clients. You can repurpose your product categories to product Recommender. You set up questions, each question including four answers. Each answer leads to a certain style, such as elegant, party outfit, street clothing or smart casual. In the end, your client gets results based on the answers given and a category recommended. Create your Product Recommender here. Let’s say you are a clothing brand that released new jackets, and you want an opinion on it and to start a dialogue. You can repurpose the images you have to a simple poll, asking people what jacket they prefer. If your blog is news based you can repurpose your news to a quiz about a certain category of news, or a general, weekly or monthly news quiz. All you do is write down questions and come up with wrong answers. Divide the score into categories and prepare feedback for the end of the quiz, based on the score received. You could give your score feedback fun names such as ‘news nerd’ for high scores and ‘Ms Clueless’ for a low score. Let’s say you are in the risk assessment business where you calculate risk for individuals or companies. You very likely have a lot of information about what type of risks people or companies undergo in certain circumstances, and even what type of insurance or service should be advised. This you can easily repurpose this knowledge to a risk assessment for your clients and help them understand the risks they undergo, and what they need to do to prepare, avoid, or invest in, based on the results of their risk assessment. You need to set up questions about risks based on your current knowledge and create incorrect answers. You already have the correct one. For each answer, you can provide feedback, which is usually a further explanation. In the end, you also provide short feedback, where you can also offer people to read further on the topic with a link to your site. Create your Risk Assessment here. Let’s say your company has a lot of information on the health benefits of a product. You can repurpose the knowledge to an educational quiz to inform your clients about it. In the example above, we have a company producing eggs and they created an educational quiz about the health benefits of eating eggs. To do that, you need to come up with questions, wrong answers and feedback in the end. In every industry, there are laws, regulations and rules to follow. Some industries are more complicated than others. If you are a company working in a complicated one, you can easily repurpose your knowledge into an assessment to help your clients know their industry laws, regulations and rules. You come up with questions, with one right answer and one to three wrong answers. You write feedback for each questions explaining the answer and feedback for the end. If your company has conducted an industry study, it’s easy to repurpose it to a benchmark assessment. In a benchmark assessment, you ask questions about industry practices and show how people stack up against others in the same industry. This can be work practice, financial practice or anything relevant to the industry. You start by listing up your results and creating questions based on it, come up with incorrect answers and feedback for each question. You can also include feedback, in the end, linking to your study and encouraging people to read it. Interactive assessment is different from a benchmark assessment in one way. It does not provide information about how the participant stands against others. Instead, it educates the participants on research results by asking questions and providing an explanation after each answer. You start by creating questions based on the research results, coming up with incorrect options, prepare feedback for each question explaining the correct answer and feedback in the end. Research results can be lengthy and timely to read through. By repurposing research results to an interactive assessment, you can brush up the content with interactive infographics and statistics and make them easier to read through. People can insert information and see a calculation and you can even setup questions before people open the research, to find out what people are looking for and shrink the paper from 100 pages to 20 based on their interests. Create your interactive e-book here. 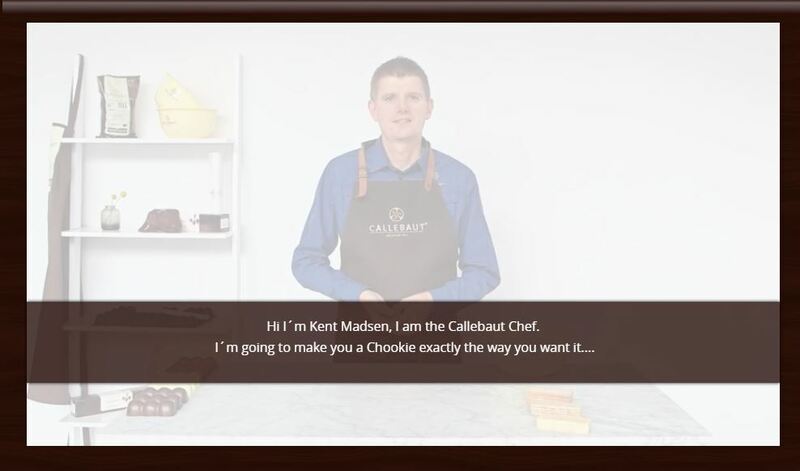 If you already have a video showcasing your product you can easily repurpose it to a shoppable video by adding ‘hotspots’ with information about the products presented, a price and a link to your webshop to purchase it. There is no limitation to how many products or hotspots you can include. Create your shoppable video here. What happens next video allows the viewer to decide what happens next. The video pauses at predetermined spots and asks the viewer a question with 2-4 possible outcomes. The viewer picks one, and the video plays that outcome. If you have a fun video, you can easily repurpose it by copying the link to an interactive platform and adding in different scenarios. It does require you to record the different possible outcomes. Create your own ‘What happens next video’ here. Let’s say you have a tutorial video, explaining something you want your audience to understand well. You can repurpose it to a video quiz and ask questions after each section to make sure your audience remembers the core message. It is very simple, you copy a link from Vimeo or Youtube and add it to an interactive platform and add the questions in. Create your video quiz here. If you think any of your videos are in good enough quality, you can gate the content with a form and ask for an e-mail address. Create your own video contest here. If your company already uses charts or statistics, you can easily turn them into interactive and clickable charts. All you have to do is move the information you already have from one place to an interactive platform. If you want to improve your customer experience and you already use infographics, you can repurpose them to interactive infographics. It’s just quick and simple. You simply move the information over to an interactive platform. If the industry you work in has a lot of buzzwords, considered annoying or funny, you can easily turn it into a fun quiz for your clients. You gather the buzzwords and their definitions, come up with wrong possible answers and set up the quiz with feedback in the end. Try out a 15-day trial at Dot.vu here. Let’s say you have a lot of pictures on your website, that you put a lot of work in. Perhaps you are a fashion blogger, photographer, or a retailer. You can repurpose them by setting them up in a lookbook. 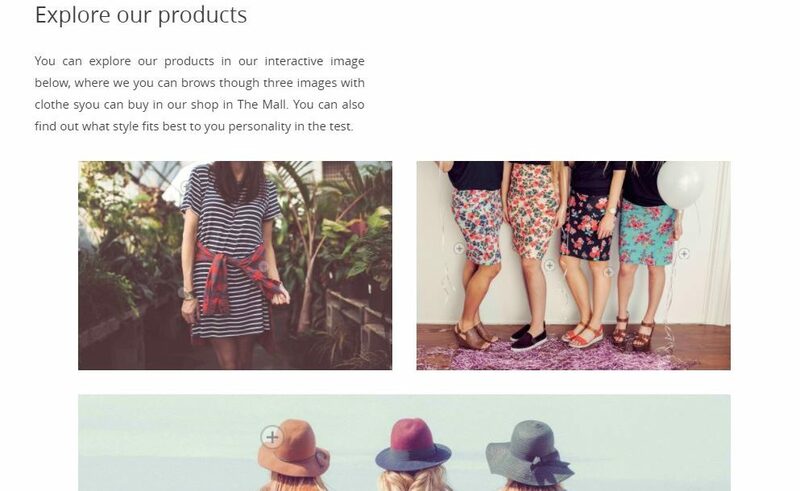 A lookbook is like an interactive magazine, easy to glance through and view information related to the product. It’s clickable, linkable and shareable. You can build it around a theme, for example, a seasonal theme, or an event-based theme. Create your own interactive catalogue here. If you have an online magazine where you can easily repurpose it to a lookbook. You offer the same content in an interactive experience where the reader can engage by clicking on items for further information, or a link to go to a different destination.